An alleged graphic from a future Thunderf00t video. After ranting against creationists, libertarians, Muslims, feminists and Freethought Blogs, controversial Internet personality Thunderf00t could be setting his sights on College of DuPage spokespersons Jill and Salam. A supporter, who asked to be called Jake, said he brought Jill and Salam to Thunderf00t’s attention. He thought he might get a laugh from COD’s radio campaign. To the Chicagoland public, Jill and Salam are known for their COD radio ads. Public documents show that the COD designed the ads to increase their “cool factor” among traditional college age students. The ads tout the college’s fun activities, number of courses, and affordability. When told about the campaign, Thunderf00t, according to Jake, became enraged. Jake said he doesn’t “drop docs,” but did give this reporter an excerpt from his e-mail. In the video, which consists of graphics and time lapses of the night sky, Thunderf00t launches surprising strong attacks against COD and the spokespersons. Sources at COD laughed then refused to comment publicly. Though one did give The Babbler a copy a video they will release of ThunderF00t starts a campaign against COD. In the video, Jill and Salam are sitting in front of a web cam in a bedroom. Jill: Hey, Salam. Did you know that Thunderf00t is flaming us on the Internet? Jill: Yeah. He says that I’m a radical feminist and you’re a radical muslim. Jill: I know. He’s such a skeptical hipster. First of all, just because I read Teen Skepchick, doesn’t mean I’m a radical feminist. Salam: Second, my religious beliefs are none of your business. You know what they say about assuming. 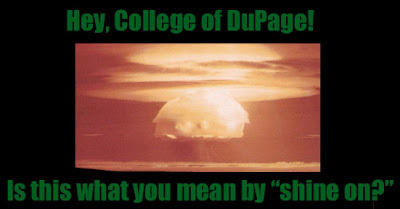 Jill: College of DuPage helps the Chicago community by offering a diverse selection of courses to diverse student body to create a diverse workforce that will shine on in DuPage! Salam: So here’s the deal, Phil Mason. You stop making comments about us, and we won’t comment about a certain part of your male anatomy. Jill: We don’t drop docs, but we can point to links. Salam: So you just go back to teaching your classes, and we’ll go back to studying at COD. Jill: Your actual savings may vary. Hit it, Salam! When asked to comment, Thunderf00t said he had never heard of Jill and Salam. He also demanded that before he answered any more questions, The Babbler host his 30 hour video in which he criticizes every member of The Freethought Blogs network. The Babbler declined.